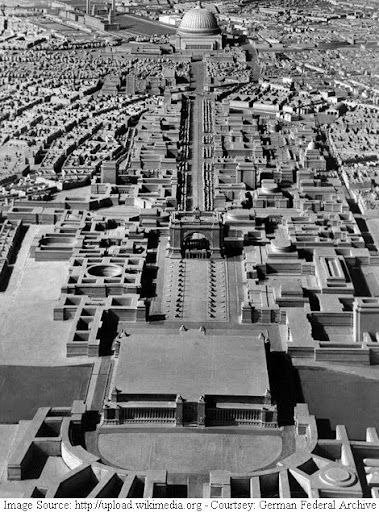 Hitler had a grandiose plan to make Berlin a World Capital. He had planned construction of massive structures in Berlin surpassing those of London, Paris, and Washington and had even decided a new name for Berlin - Welthauptstadt ("World Capital") Germania. 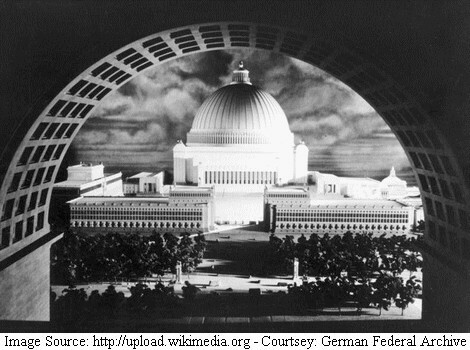 Here is a model of his planned renovation/reconstruction of Berlin. Link to image source page. 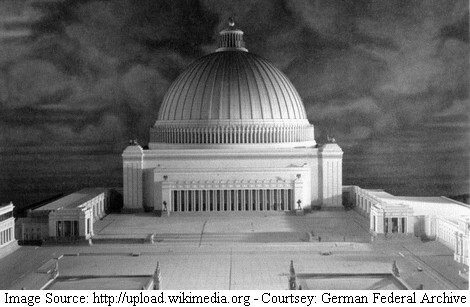 Among the major buildings he had planned one was the Volkshalle ("People's Hall"), also called Große Halle ("Great Hall") or Ruhmeshalle ("Hall of Fame"). It would have been huge building over 200 metres high and 250 metres in diameter. It's 46 metres diameter home would have accommodated the entire dome of Vatican's St. Peter's Basilica. The second was to be a Triumphal Arch almost 100 metres high. The Arc de Triomphe at Paris would have easily fitted inside its opening. The third mega structure was a huge stadium capable of holding 400,000 spectators. Had this stadium been completed it would remained the largest in the World today by a considerable margin. The 1936 Summer Olympics stadium was a precursor to this proposed giant. He had planned for completion of the new Capital by 1945 however his grandiose dream didn't materialise. His plan for of quick total victory in Europe was thwarted by Great Britain and then reverses on the Russian front and finally his defeat ended the Welthauptstadt ("World Capital") Germania project. 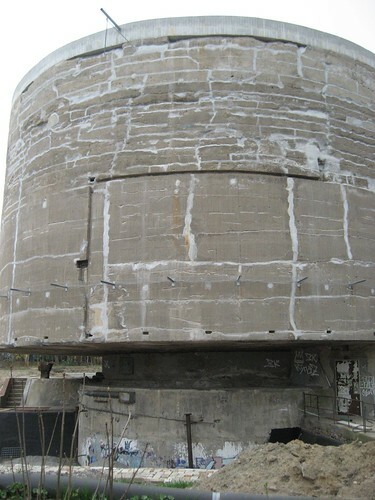 The only structure which was created as a part of his grandiose plan was a huge concrete cylindrical test block called Schwerbelastungskörper ("Heavy Loading Body"). It was built in 1941 to test the load bearing strength of the Berlin soil where the massive Triumphal Arch was to be constructed. The test cylinder is 18 metres high and has a mass of 12,650 metric tons. Like a giant mushroom it rests on a smaller cylinder which passes to an underground chamber through a caisson. After the end of war it was planned to demolish it but being located in the residential area its demolition by dynamite was considered unsafe, hence it was finally left untouched and uncared. In 1995 it was declared a historic monument and is being renovated and turned into a history museum. A small auditorium is also planned in the measurement chamber below the heavy weight which contains the instruments to measure the gradual sinking. These instruments are still functional. 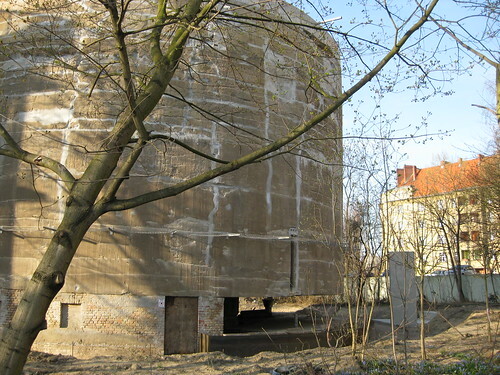 Ironically its test results show that the Berlin soil was unsuitable for the massive construction planned by Hitler.